Publicators Email Marketing - Blog - Newsletters - The Next SEO Game Changers? It is quite possible that Google will start using email newsletters as a factor in its Search Engine Page Ranking. If your emails are undesirable, and even marked as "Junk / Spam", your website's SEO might suffer. A great article on Search Engine Watch explains this new development. We'll share the knowledge with you from the Email Marketer's perspective. On July 30, 2015, Google got a patent approved: they have found a way to use Spam / Junk Emails flagging as a website Search Engine placement instrument. If you send great newsletters, and get many subscribers to click on your website links, of course, these gained pageviews eventually improve your SEO ranking. But it’s not the direct way of influence Google is in the process of setting up. 1. Gmail users flag emails as Spam/Junk. 3. [Gmail=] Google looks into these flagged emails, its content and links, to find a website domain name, usually in the sender’s name, in order to figure out which web pages are related to this undesirable email. Now Google knows the Sender's Score as well as the Sender’s website domain. 4. Google will use the Sender Score (=Reputation) as an element in its Page Ranking process on the Sender's website. Spammers, of course, will lose points - and this time not because of unoriginal / unhelpful content, or misused keywords, but because of the newsletters! Newsletters that were sent from completely different IPs, that technically, up until now, had no effect on your Google PageRank. SEO and Email Marketing are the two best online marketing tools - in terms of ROI. We are used to thinking about them as completely unrelated operations. Usually they are run by different team members or outsourced, without any correlation. Newsletters and landing pages are important pieces of content. They help build your brand no less than guest posts in blogs, and videos on YouTube. Measuring the quality of this content is about to change. They will be analyzed not just in terms of originality, and number of page views, but also by the quality, or ranking, of the server from which this content is being distributed. Great ESP (Email Marketing Providers = Vendors) prime their IPs, keep them “clean”, whitelisted. “Blacklisted” servers, servers that spammers use and get complaints about, could be dangerous to your SEO, very soon. Google will probably start implementing this technology, perhaps already in 2015. Both Email Marketers, and SEO pros, should prepare for this scenario. SEO managers should get to know the company's Email Service Provider, and keep a close eye on email campaigns reports - especially Spam flagging reports [link to article on Publicators website]. Email Marketers should touch base with SEO managers and be alert of any sudden changes to the company website's placement in Google’s search results. 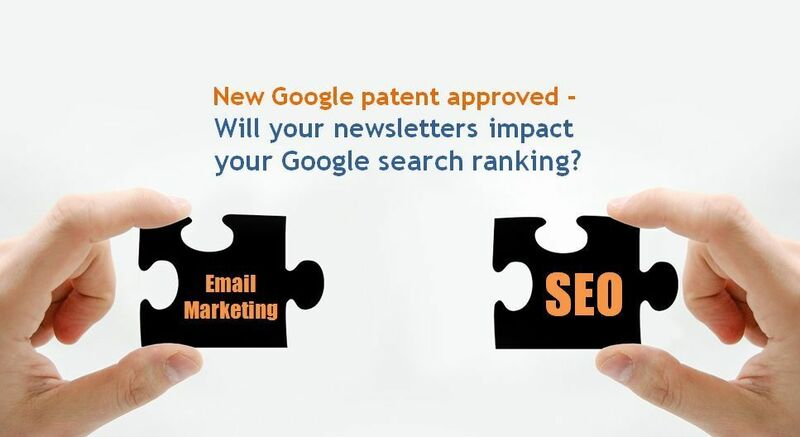 Until Google puts this patent into action, how can email marketers prepare? Keep a close eye on any Spam Complaints - should some be received. Take preliminary measures and manage your lists quality: get subscribers permission to send emails, take unsubscribers off all lists immediately upon request. We would be happy to analyze your content and suggest improvements - in preparation towards this new development. You are welcomed to contact us by phone or email.